The annual monster holiday is a time for over-indulgence and special treats. But forget ice-cream sundaes and sparkling cocktails. The monster crowd have something much more gruesome in mind! Having already cut his teeth – or rather, his monster fangs – in Spider Sandwiches and Dragon Jelly, Monster Max has already shown an appetite for rather unconventional dishes. There’s an air of excited anticipation as Monster Max and his pals jet off on Queasy Jet (hee hee), where the in-flight meal of moth mash with tapeworm sausages and pureed eel is a highlight. 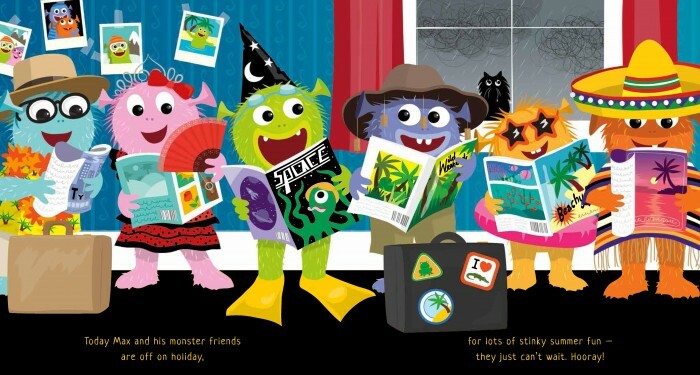 Whether day-tripping at a theme park or lounging by the swimming pool, the monsters indulge in a world that is slurpy, burpy, gunky, stinky, gloopy and slimy – and they’re loving every minute of it. Children, too, will delight in the monster’s less-than-salubrious habits and disgusting goings-on that are so far from their own experience, like being slathered in sunscream that smells of rotten eggs, munching on caterpillar croissants for breakfast and supping on scum shakes. 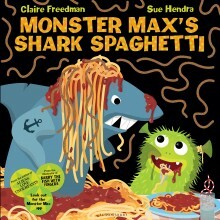 We love the touchy-feely texture of the cover, too, with its stand-out sparkly shark spaghetti. Written in a jaunty rhyming text, there’s plenty of funny details to spot in the lively illustrations too. Plus, a very amusing sting in the tail – quite literally – with a flying sharp tooth that lands in the most painful of places. Ouch! *** Still hungry for monsters? 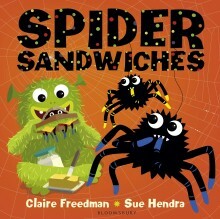 *** See Max and his friends in their debut book Spider Sandwiches, now out in a new boardbook version with a fuzzy-felt touch-and-feel cover. Did you know? Monster Mash is a 1962 novelty song by Bobby “Boris” Pickett that celebrates the monster movie genre in a humourous way. The song was #1 on the Hot 100 chart on October 20–27 of 1962 and has become perennial Halloween holiday favorite ever since. Author notes Claire Freedman began writing after joining a creative writing class. The first children’s story she wrote for a magazine called Twinkle was accepted for publication. Since then she has written over 50 children’s books, including the bestselling Aliens Love Underpants series, which has sold over 1.5 million copies worldwide. 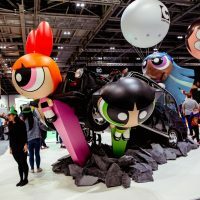 Claire loves to create worlds for young children to enjoy and escape into – whether the stories are educational, bedtime, problem solving or just plain good fun. She lives on the Essex coast with her husband, Michael and enjoys bracing walks along the sea path. Sue Hendra graduated from the University of Brighton in 1994 and has been an illustrator of children’s books since then. She has worked on over 70 titles, including the fabulously funny Barry the Fish with Fingers. Sue lives in Brighton with her partner and their young daughter.